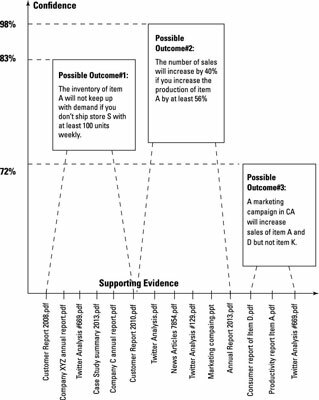 Many models use decision trees as their outputs: These diagrams show the possible results from alternative courses of action, laid out like the branches of a tree. 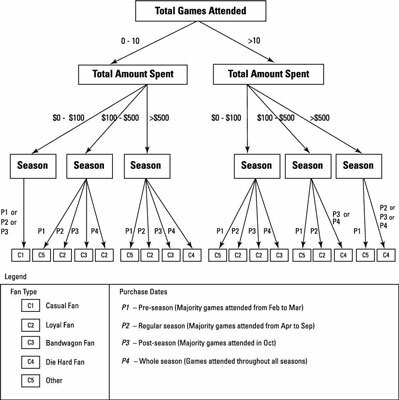 Here is an example of a decision tree used as a classifier: It classifies baseball fans based on a few criteria, mainly the amount spent on tickets and the purchase dates. From this visualization, you can predict the type of fan that a new ticket-buyer will be: casual, loyal, bandwagon, diehard, or some other type. Attributes of each fan are mentioned at each level in the tree (total number of attended games, total amount spent, season); you can follow a path from a particular “root” to a specific “leaf” on the tree, where you hit one of the fan classes (c1, c2, c3, c4, c5). Suppose you want to determine the type of baseball fan a customer is so that you can determine what type of marketing ads to send to the customer. You want to know whether the customer is a baseball fanatic or someone who just rides the bandwagon. Suppose you hypothesize that baseball fanatics and bandwagon fans can be persuaded to buy a new car (or other discretionary goods) when their team is doing well and headed for the playoffs. You may want to send them marketing ads and discounts to persuade them to make the purchase. Further, suppose you hypothesize that bandwagon fans can be persuaded to vote in support of certain political issues. You can send them marketing ads asking them for that support. If you know what type of fan base you have, using decision trees can help you decide how to approach it as a range of customer types. Assume you’ve run an array of predictive analytics models, including decision trees, random forests, and flocking algorithms. You can combine all those results and present a consistent narrative that they all support. Here confidence is a numerical percentage that can be calculated using a mathematical function. The result of the calculation encapsulates a score of how probable a possible occurrence is. On the x axis, the supporting evidence represents the content source that was analyzed with content-analytics models that identified the possible outcomes. In most cases, your predictive model would have processed a large dataset, using data from various sources, to derive those possible outcomes. Thus you need show only the most important supporting evidence in your visualization. The power behind this visualization is its simplicity. Imagine, after months of applying predictive analytics to your data, working your way through several iterations, that you walk into a meeting with decision-maker. You’re armed with one slide visualization of three possible scenarios that might have a huge impact on the business. Such a visualization creates effective discussions and can lead management to “aha” moments.